King Solomon was known not only for his wisdom, but also for his administration of justice tempered with compassion for those struck by adversity – a theme that runs through many of the sayings attributed to the famous monarch in the Book of Proverbs. Now, in the wake of the housing collapse and damage from recent Hurricane Sandy, many large mortgage companies are extending some concessions (prudently, of course) to struggling homeowners. In recent posts we’ve discussed the short sale phenomenon – a homeowner in distress who’s making payments on a mortgage, but just barely, petitions a lender for the right to sell the house for less than the mortgage is worth. The homeowner gets out of the deal with no profit, but without foreclosure and the resulting stain on their credit. Either the lender takes what they can get and forgives the difference between the loan total and the sale amount, or the seller ends up repaying it as a debt in collections. One key reason short sales are outstripping foreclosures involves concessions made by lenders, whose newly established hardship criteria make it easier now to approve a short sale. These hardship criteria have been expanded to cover a wider range of misfortunes that can put a homeowner underwater – unable to manage monthly mortgage payments. 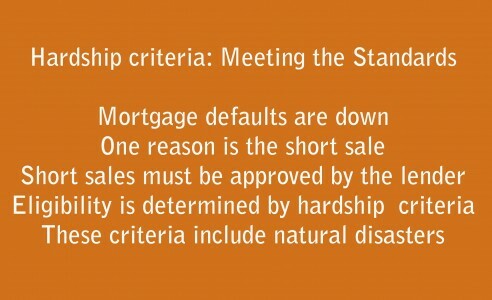 Under these standards, homeowners who are current on their mortgage payments, or nearly so, can qualify for a short sale if they are unemployed, involved in a divorce, or have a long term disability. They can also qualify if they’ve been forced to move more than 59 miles away for a job. But other, less obvious categories of hardship have also been created, ones that are suddenly made relevant by the damage of Hurricane Sandy. In addition to the failure of a business or the death of a wage earner in the family, homeowners experiencing a man-made or natural disaster such as fire or flood can also qualify for a short sale. This qualification helps property owners in areas hard hit by Sandy who already struggling to keep up with their mortgages to cut losses and get out of their mortgage quickly without going through foreclosure. What does this mean for income property investors following Jason Hartman’s advice on creating wealth through real estate investments? The changing standards of mortgage lenders in response to the new, economy-driven housing market will affect investors seeking financing for new investments. The trend in short sales means fewer foreclosure houses to hit the market, but more from the quicker short sale process. These factors, combined with historically low mortgage rates, open new opportunities for investors to purchase properties. Jason Hartman advises purchasing investment properties on a fixed rate mortgage of around 30 years. And, as lenders extend support to struggling homeowners in a gesture reflecting Solomon’s, these changes in mortgage lending also open new opportunities for investors to start creating wealth with income property.